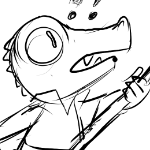 What happens when a kobold and a kenku turn the chaotic neutral dial up to 11? An homeless woman learns the truth of her celestial origins and ascends to the stars. 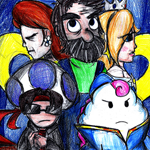 Forged Fear is an alternate universe fan comic based on Super Mario RPG. In this story, Smithy won. Mario, Peach, and Bowser are gone. Geno never showed up. Mallow was never reunited with his parents. 20 years have gone by in the era of Smithy.